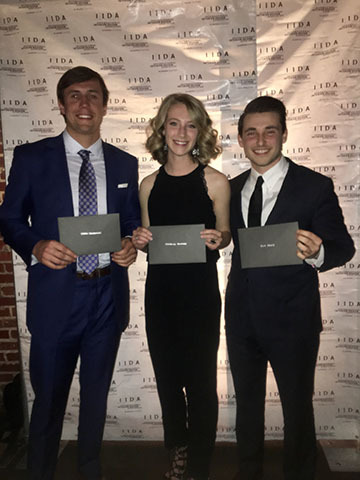 Three Samford University interior architecture students were recognized for their accomplishments at the IDIE awards April 7. This biannual design awards ceremony was hosted by the Alabama chapter of the International Interior Design Association. There were three categories for which students could enter their studio projects, and Samford students swept awards in all three. Drew Pederson, a senior from Moorestown, New Jersey, took home the award for Corporate Office; Rich Fridy, a senior from New Port Richey, Florida, received the award for Restaurant/Hospitality; and Madelon Roser, a senior from Boise, Idaho, accepted the award for Student Choice. Students from Samford, Auburn University, the University of Alabama and the University of North Alabama were eligible to participate for student awards.